While it’s possible to earn additional training and certificates for other areas of dentistry, including orthodontics, periodontics, and endodontics to name a few, cosmetic dentistry doesn’t have that same reputation. The closest a dentist can get to specializing in cosmetic dentistry is through a field known as prosthodontics. This field focuses on the design, manufacture, and fitting of artificial replacements for teeth or other parts of the mouth. If you plan on getting porcelain veneers placed, ask your dentist if they have any training in this field. They’ll be more than happy to tell you about the classes or post-graduate education they took to effectively place restorations like veneers. 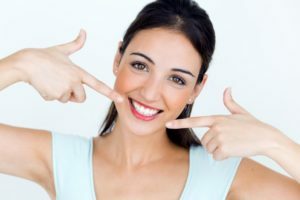 If they consider themselves a prosthodontist, you’re far more likely to get a better outcome when it comes to cosmetic treatments that use artificial teeth to enhance your smile. Another great way to confirm a dentist’s cosmetic abilities is to peruse the reviews left by previous or current patients. These are most often found on the practice’s Google page and can be easily filtered to show their best and worst reviews. Make sure to look specifically for experiences that requested the dentist’s cosmetic treatments and not simply routine exams or cleanings. You can also largely benefit from asking your dentist to show previous patient cases. Think of this as a portfolio to help give you a better expectation for your own treatment. If the dentist is confident in their abilities, they should have no issue showing you their previous work. You can learn a lot about their practice simply by viewing the services they offer on their website. Just like how a family dentist should have many treatments for kids, a cosmetic dentist should have many options for enhancing your smile. If your dentist claims to specialize in cosmetics, but only offers teeth whitening and dental bonding, what does that say about their range of expertise? If you get the chance to visit, ask them which technologies they offer to enhance your smile. For example, ask if they offer multiple treatments to solve the same problem. By being proficient enough to offer multiple services, your dentist proves he’s willing to take the initiative to meet patient needs. Not sure if your prosthodontist in Orange Park is the person for the job? Schedule a consultation with him to learn more! Dr. Matthew Nawrocki earned his DMD degree from the University of Florida College of Dentistry. He’s also completed a one-year fellowship in prosthodontics, furthered his training through a three-year residency program in prosthodontics, and became board-certified eligible in the field after passing his written board exams. To learn more about his practice, contact him through his website.